The Perseid Meteor Shower is considered one of the best and brightest of the year. It’s been building up over the past few weeks and peaks this week with 50-100 shooting stars an hour! 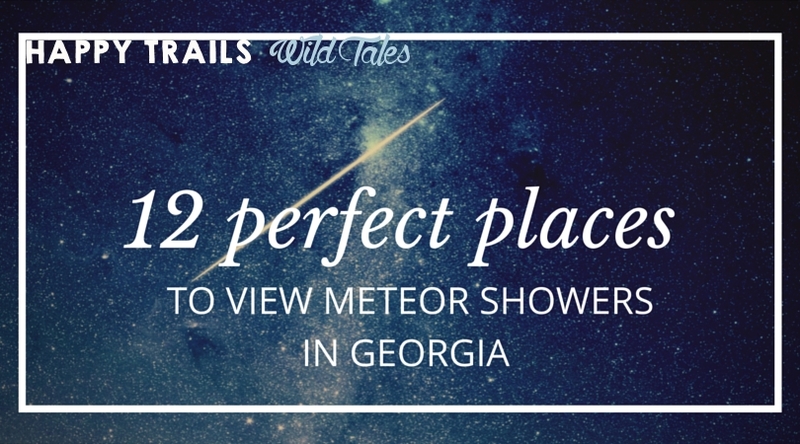 The best places to view a meteor shower are dark skies away from the pollution of city lights; places like Georgia’s “Dazzling Dozen” listed here. Hamburg Outdoor Recreation Area – Located about halfway between Macon and Augusta, Hamburg Outdoor Recreation Area offers 30 full service (electric/water) campsites in a campground on the edge of a lake. Horse Creek WMA & Flat Tub WMA – Northeast of Tifton, in Georgia’s Magnolia Midlands lies Horse Creek and Flat Tub Wildlife Management Areas. Primitive camping is available year-round unless otherwise posted. Be aware that this is hunting land. Big Hammock WMA & Big Hammock State National Recreation Area – Camping is permitted year-round in Big Hammock WMA, under the dark & starry skies of Georgia’s Coastal Region. Be aware this is hunting land. Stephen C Foster State Park – The darkest sky in Georgia with the least amount of light pollution is found in the Okefenokee Swamp. Stephen Foster State Park, the western gateway into Okefenokee, frequently invites stargazers to participate in amateur astronomy nights. Overnight accommodations at the park include 64 campsites and 9 cottages. River Bend WMA – Located about a third of the way from Macon to Savannah, River Bend WMA offers camping under dark and starry skies. Be aware this is hunting land. Providence Canyon Outdoor Recreation Area – Georgia’s “Little Grand Canyon,” is beautiful during the day and perfect for spotting shooting stars at night. There are only 6 backcountry campsites, but they are reservable on the state park’s website. Bobby Brown Outdoor Recreation Area – Bobby Brown Park, nestled on Clark’s Hill Lake at the Georgia-South Carolina border, is now managed by Elbert County. Information for camping at the 61 campsites in the campground is available here. AH Stephens State Park – Count shooting stars under the starry skies of AH Stephens State Park, west of Augusta. The park offers 22 campsites and 4 cottages for stargazers. Brasstown Bald – Get above the night lights at Georgia’s highest peak for a wide open view of the night sky. There is no camping or cottages at Brasstown Bald, but plenty of campgrounds and hotels nearby. Charlie Elliott Wildlife Center – Primitive camping and an open astronomy field are available at Charlie Elliott Wildlife Center in Mansfield, Georgia. Big Lazer Creek PFA – Big Lazer Creek is a public fishing area nestled under darker skies between Macon and Columbus. Camping is permitted.